I make soap for two reasons. First, is in self-defense. Commercial soaps, even those which are supposed to be gentle, leave me itchy and dry. I don't think of my skin as sensitive, so I don't think I am alone in my feeling that store bought soap just doesn't cut it. Second, is to satisfy my need to cook. I was a chef for many years. I love to create in the kitchen and formulate recipes. With just the two of us here, I certainly can not cook in the quantities that I did when I was working in catering. And so, I soap! 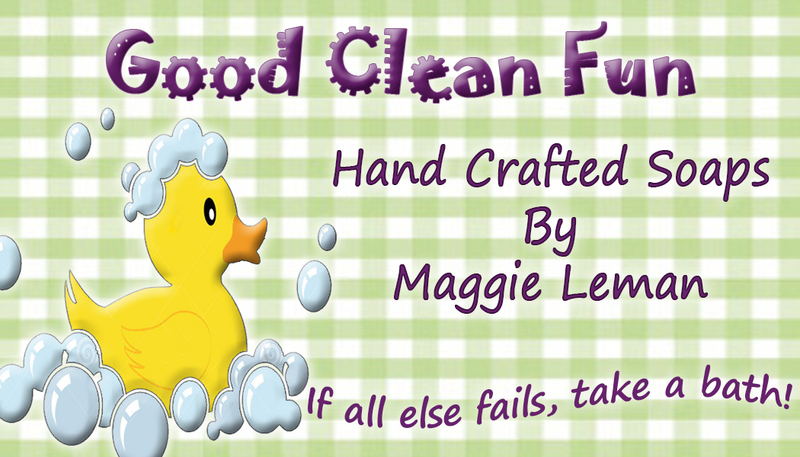 My goal was to create soap that leaves skin clean, smooth, soft, and moisturized, with no irritation. I love to use oils and butters that nourish, in blends that are exceptionally gentle. To that I add goat milk and other skin-loving ingredients such as natural clays, herbs, essential oils, juices and vegetable purees, and natural exfoliants. I also love to create beautiful colors and great smelling soaps with top quality micas and fragrances, and essential oils. As I have made peace with my skin again, I have branched out into complementary products. I create several types of scrubs and cleansers for face and body, lotions and butters for extra moisturizing, soothing salves, balms and ointments, rejuvenating facial masks, and relaxing bath salts and soaks. Sorry, I do not ship body butters, lotion bars, or bath truffles during the warm months as they are prone to melt in transit. But you can come shop at the craft fairs I will be attending. 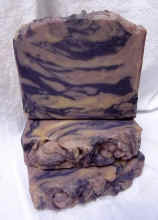 Due to the inherent nature of handmade soap the actual product may not match the picture. 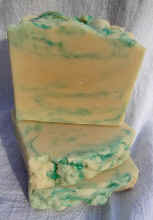 Some soaps may darken due to vanilla content, even if the fragrance does not say vanilla. You must purchase shipping separately according to the number of bars ordered. I will also be happy to figure your shipping and send a special PayPal invoice by email. Just leave a note through your PayPal invoice when you pay for your order. 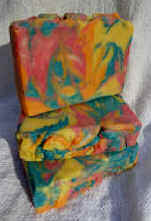 This is our signature soap made with goat's milk. Legend says that the secret to Cleopatra's beauty was bathing in goat's milk. 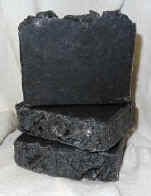 Goat milk soap gently cleanses, has a silky rich lather, and leaves you feeling royally pampered. Secret Garden - Exotic spicy cardamom with rose. Tea Garden - White tea and crisp herbal fern. Serendipity - Orange blossom with a hint of patchouli. 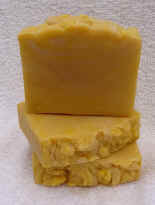 In addition to goat's milk, Heartland soap has oatmeal and honey to soothe and nourish your skin. 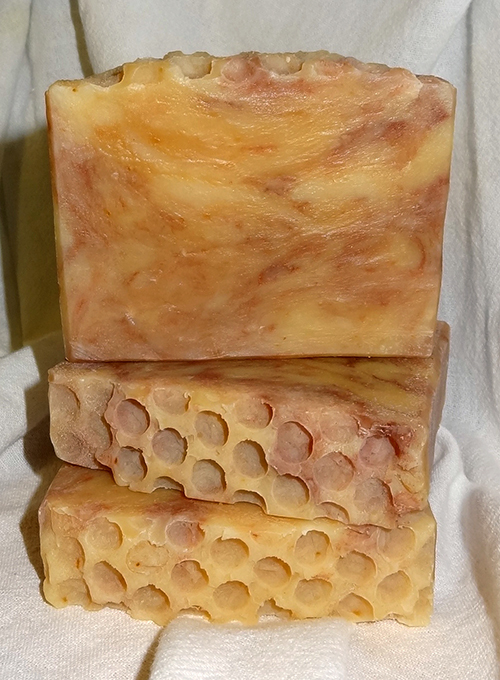 Heartland soaps are honeycomb textured. 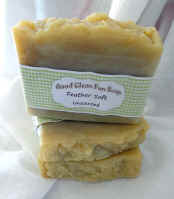 Feather Soft is a very mild soap especially for baby's skin, or for very delicate sensitive skin. It has goat's milk, honey, and oatmeal to gently cleanse and sooth. 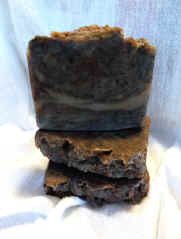 Made with no colors or fragrance, it has a natural honey and oatmeal scent and color. This is my personal favorite for everyday. Bars back in stock soon! Made especially for cleansing your face, this soap is excellent for all over. It is super-fatted with Shea Butter, a non-comedogenic oil (does not block pores). 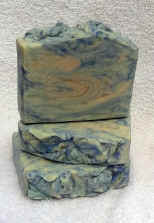 This soap is great for delicate, dry, or sensitive skin. Made with goat's milk, avocado oil, French green clay, Pink kaolin clay, and lavender, clary sage and chamomile essential oils. Clear Day soap is made with goat's milk, activated charcoal, natural bentonite clay, zinc oxide, oatmeal, and healing Tea Tree and Lavender essential oils, to help with cleaning oily skin that is prone to breakouts. Super-fatted with Shea Butter, and made with oils that will not clog your pores, it will not strip or dry your skin. Did you know coffee is great for removing odors from you skin? After working in the garden, tuning up the car, or chopping onions or garlic, our goat's milk, coffee and mint soap will help remove odors and be gentle to your skin. Here's soap especially for bathing your dogs, your goats, your horse, or any other animal friends, EXCEPT CATS. It will leave them clean and fresh, smelling great! 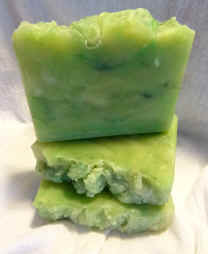 It is a specially formulated shampoo bar, with pet-safe essential oils. It rinses incredibly easily, and leaves the coat soft and shiny, without stripping natural oils or irritating skin. Pawprint bars are 2" x 1.75" and fit nicely in the palm of your hand for lathering up your pup! You get 2 with your order. 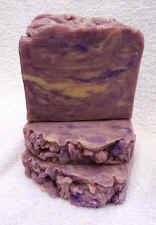 Made with essential oils of lavender, tea tree, and lemongrass. No color added. Please check our Mini Mart page for ordering and shipping policies.